Photo provided by Shari Town Office. 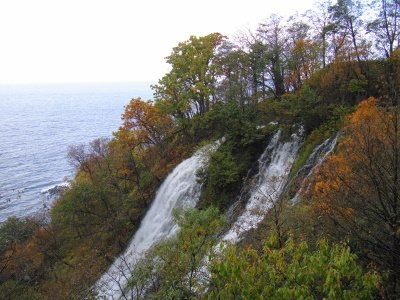 Shiretoko National Park, located on the Shiretoko Peninsula in eastern Hokkaido, is one of Japan's most beautiful and unspoiled national parks. Shiretoko is a good example of marine and land ecosystems being correlated, and its biodiversity is very important for salmon, migratory birds and sea mammals, including sea lions. Eastern Hokkaido is an unusual image of Japan; the area is a large unspoiled rural region with the scenery similar to northern Sweden with Japanese signs! I started my trip at Kushiro; the city was famous for its seafood. Then I took a train to Shari, this rail line was quite well known in Japan as it run thru two famous Hokkaido attraction, the Kushiro Marshland and Lake Mashu. The marshland was really surprising when I unexpectedly spotted the Japanese cranes which I heard really hard to see outside reserve area. I reached Shari/Shiretoko station before noon, the lovely designed station really reminded me last year Hiraizumi train station, the connecting bus to Shiretoko National Park was conveniently parking just outside the station. Along the way was beautiful view of mountain, waterfalls and sea coast with protective wire fence separating national park and outside word. My destination was Utoro, a small tourist town just outside Shiretoko National Park, after hotel check-in, it was a time to explore Shiretoko. I was the only tourist on the bus to Shiretoko Five Lake, when the bus crossed the bridge outside Utoro; the driver welcomed me with broken English to Shiretoko and pointed to the direction of a herd of cute deer on the hill next to the road. They were everywhere on the very steep hill and behind them was the view of the whole town of Utoro and the Okhotsk Sea below! Shiretoko gave me the first "WOW". After deer surprise, the bus continued to the park inner zone and then snow was started to pour, then came with the thick mist, I was really worried with the weather situation. Finally I was at Shiretoko Five Lakes, the visibility was really low then I could not see the tourist center, with some luck and pre-research I guessed the right direction and found a sign to the lake. The tourist trail was the boardwalk so it was quite easy, the boardwalk in the thick mist was really beautiful, I felt like I walked on the clouds and the boardwalk was the bridge to heaven, my second "WOW". After 15 minutes the mist was gone and I finally could see one of the five lakes. The view was fine but nothing remarkable, after some photo I walked back to tourist center, bought some souvenir and then backed to Utoro to catch the cruise tour, along the way back I noted some similarities of Shiretoko and Shirakami-Sanchi range I saw last year with theirs many beech and pine trees. For the cruise, the cruise ship was packed with Japanese tourists, and it was quite hard to appreciate the view in such a situation that everyone also wanted to see the same spot with you. The view was fine but again nothing special; I personally preferred the land route. After long day, I backed to hotel, had onsen and a very delicious kaiseki meal with nice sake (my third "WOW"). It was a really nice day after all. In my opinion, Shiretoko is a nice place to visit if you are in eastern Hokkaido; the place was not the top sight of this island. However the protection of Shiretoko is a reason to visit and it is very interesting, after the site became a World Heritage Site, tourism is increasing dramatically effecting environment in the park. To prevent problem, more restriction on tourism and some areas are totally closed, in the old time tourists could walk freely to see all five lakes, but now only one lake is allowed via boardwalk. If you want to see other four lakes then have to go with expensive guide tour in high season. Shiretoko is going on the way of sustainable development, and a good place for us to learn how to protect fragile environment from facilities development for tourism. To view the Shiretoko Peninsular I took a cruise on the tourist ship 'Aurora' and sailed along the north coast of the peninsular. I boarded the vessel in the port of Utoro, which I reached by bus from outside Shiretoko Shari station. 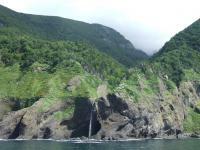 The voyage provided a panoramic view of the bush clad peninsular, including its waterfalls, rock formations and steam rising from thermal vents along the ridge. At Cape Shiretoko where a lonely lighthouse stands looking out towards the Russian Kurile Islands, clearly visible just a few kilometers away, the vessel turned to return to Utoro. This popular 4 hour cruise cost 6500 yen. I visited Shiretoko in October 2008. We went to see the fall foliage, which was beautiful. One thing to keep in mind is that Hokkaido is very cold starting in early October and many of the sites in Shiretoko are closed starting in the end of September. We only saw the sites close to the visitor center and along the roads in the park. The weather was rainy and cloudy and a lot of mist covered the mountains. It made the scenery very dramatic and showed the raw nature of the park. Of course so did watching for deer and bears on the road as we drove through rain and snow up at the top of the mountain pass. I plan on going back this summer so that I can enjoy another aspect of this fantastic place. I visited Shiretoko this past summer vacation. It is beautiful. Stayed at a crowded, but cheap campsite in Utoro. Not to be missed are the hotsprings kamuiwakka and Iwaobetsu. Both are incredible. Rausu hotspring is unbearably hot. Also the 5 lakes of Shiretoko are amazing especially on a sunny day when you can see the reflection of the mountain range. Wild deer are everywhere. If you have the energy, the hike up to Mt. Rausu is very nice. Stunning views. Overall a really great place with so much wildlife. I highly recommend Shiretoko. Language isolate: Ainu - The Shiretoko peninsula, stretching out to the north-east of Hokkaido, the northernmost island in the Japanese archipelago, is the ancestral home of the Ainu people. Ainu has two dialects (Hokkaido and Sakhalin), which are sometimes considered separate languages. 24 Community Members have visited.